Offering incredible comfort with a unique Ergoflex back mechanism, all Faith Series stacking banquet chairs are designed for superior performance and reliability. Nufurn's Faith Series of banquet seating is designed with a variety of commercial grade fabrics to choose from that offer excellent wear properties. High resilience fire retardant commercial grade foam for ultimate comfort and durability. Nufurn's Faith Series stacking banquet chairs are built with a structural support bar welded in between the two rear legs. 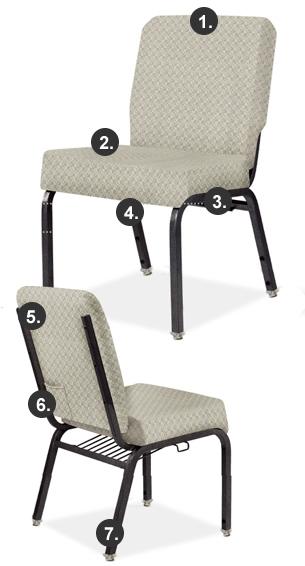 This creates lateral rigidity and significantly increases banquet chair durability. Unique stacking pads to protect the frame and upholstery. These pads allow for an average stack height of 10 chairs high for Faith Series stacking banquet chairs. All frames are fully welded for ultimate strength. Commercial grade powder coating is standard with a choice of aluminum or steel tubing available in a range of styles and colors. Top stitching provides the ultimate in tensile strength on seams ensuring enhanced fabric performance for years. Both self levelling glides and resin chair glides allow for easy movement while seated and provide protection to all floor surfaces. Every one of Nufurn's stacking banquet chairs are handmade to ISO 9001:2001, ensuring an exceptionally high quality finish in all aspects of design, manufacture and finished product.